I love this perspective! I get so frustrated with articles / movies / books portraying one extreme way of eating as the only way. I think it’s very confusing, especially for people just getting into healthy eating, to hear such contradicting information. I’m excited to check out the books you recommended! I was thinking of (finally) getting In Defense of Food myself! It seems like a great read! Hey, thank you for using your platform to debunk bad nutrition science and food fearmongering. It worries me when a documentary like What The Health (or a similar book) becomes popular, because scaring people away from entire categories of food affects public health at every level — particularly at the lower end of the socioeconomic scale, where people often can’t truly afford to shun large sections of the grocery store. I appreciate seeing a more measured, science-based pushback. Great point. I assume most people reading/posting here are a little further up on Maslow’s pyramid and have the luxury of debating different types of diets as opposed to prioritizing cheap calories. It’s important that the loudest message to the public as a whole is “here are the small steps you can take FIRST to improve your diet”. I am glad I never touched what the health–because i think a lot of the arguments are skewed since the facts presented are using old science. I have yet to read it, but I have it rented out from the library, the new book, “Flavor – The Science of Our Most Neglected Sense,” by Bob Holmes is on my to read list! It sounds intriguing. Thank you for this Kath!!! I don’t know if I suffer from orthorexia but I often have MAJOR anxiety over the foods I am eating. It just seems like there is so much conflicting information out there, and so much diet labeling that you feel no matter what you choose to do it is going to be wrong in some way. I’ve eaten so many different ways- paleo, vegetarian, vegan, I even tried raw (for like a day before I completely caved and NEEDED something warm) and nothing feels right to me. Is it just me or do you just feel better when you try not to think about it so much… maybe ignorance is bliss. I listened to a podcast by Brooke Castillo a while back where she talked about normalizing eating. She says “I just wanted to go out with my friends, enjoy a meal, and not feel guilty about it.” I think that is where everyone strives to be. You want to eat healthy food because it makes your body feel good, but also to enjoy going out and partaking with friends. This is where I am in life, I will have to find this podcast! Thanks! I feel like I was in that place about a year ago and it was really hard to feel so crazy around food. I read intuitive eating at that time and really tried to give that my all, working the chapters step by step and I finally feel like I am back to eating healthy foods from a place of self care instead of fear and duty. I’d definitely suggest the book! I love the Omnivore’s Dilemma, also by Michael Pollan. He’s a great writer, very witty and engaging. I think I read it after watching Food Inc, another Netflix documentary. Really excellent post – agree 100%! My takeaway from those documentaries is: of course your health will improve if you move from a standard American diet to a plant-based, vegan diet. OF COURSE (looking at you, Forks Over Knives…). But I’ love to see the comparison of Vegan and “conscious” meat-eater. What works for our family is to eat much like you describe – as many plants as possible alongside sustainable, responsibly raised/sourced meat products. I would not feel healthy and happy without these things. Favorite food books include Why We Get Fat (And What to Do About It) by Gary Taubes, The Case Against Sugar (also by Gary Taubes), Practical Paleo by Diane Sanfilippo and the Clean Start/Clean Eating cookbooks by Terry Walters (these are vegetarian recipes and gave me tons of great ideas for incorporating more plant-based sides). I have one of the Taubes books but couldn’t get through it because it was so serious and long but I am really curious about what he has to say because his name has come up a lot. I wonder if there is a Podcast or something that condenses it all? I’m also a dietitian and really like the Intuitive Eating book. So many of my patients over complicate nutrition and believe they just can’t do it because they have to eat “clean”… then they fall in to a pattern of extreme eating. For the same reason I oddly enjoy French Women Don’t Get Fat. Being sensible about what you eat is important. And Cooked by Michael Pollen. I think there is so much to be said for cooking at home. 95% of all diets fail. Finding the small maintainable changes you can make is the only thing I advocate for. And the Science Vs. Podcast is a favorite. They tackle a lot of nutrition topics but present the science of both sides. I have seen Marian Nestle a few times and listened to Andrew Well but feel they present one side. At the end of the day as a dietitian I think it’s my job to follow the science. I love intuitive eating too! And thanks for the Podcast rec! I really really appreciate this post today. A few friends had talked about how much they liked the documentary, so I gave it a try last night. I had to turn it off about 10 minutes in because the message just didnt sit well with me. Too extreme. I read your blog to get my daily dose of exactly the viewpoint you expressed today. Eating the squiggly line. Enjoy food, but with balance. And eat lots of plants. 🙂 Thank you again for keeping it real. I didn’t watch the documentary and I really don’t have the desire too. I am a mostly vegetarian (adding in fish, eggs, and the occasional bacon when my body is low on iron and craves it), but I agree, we should ALL be eating plant based and then adding in any additional animal based products that feel good to you and in your body. I recently read “It Starts With Food” and really like that! You might be interested to listen to Sam Harris’ discussions about the ethics of eating animal products. I really liked the conclusion that he came to (unless he’s since changed it). Essentially, he’d interviewed someone about eating animals and how inhumanely most of them are raised so he tried to go vegan. But then he ended up eating some fish and cheese, I believe. He described it as trying to make decisions based on a cognitive scale. For example, eating a sea scallop would be better than eating a cow because the cow has a lot more capacity for suffering. He also said he wasn’t sure if there is a need for vegans to be SO strict, because surely eating a largely plant based, mostly vegan diet is doing way more good than if he were eating with no regard to where the food was coming from. I liked his moderate approach, because that’s how I eat and people don’t understand it! Everyone is like, you are NOT vegan or vegetarian because you sometimes eat fish. OK, but I eat A LOT of vegan food. A lot!!! So I can’t have the label, but I feel like I’m really making a solid effort and it’s not just a fad for me. I’ve been this way my entire life. I like that concept. I could see myself becoming pescatarian but I don’t think I could give up seafood. Hi Kath, FYI, a pescatarian does eat fish and shellfish. Sara, I really love this and will check out his discussions. I have the same difficulty explaining why I will eat some things and not others. I am not a vegetarian, yet I cannot handle that animals suffer. I have been limiting meat to once a week and buying milk, eggs and meat/poultry from places that are certified humane. Even though I am paying more, I have these things much less than I used to so I am actually saving money. I feel like I am just doing the best that I can, but I would love to hear more about this subject so I will check him out. I couldn’t agree more with what you said – there is no evidence to say a plant based diet with a little bit of animal products is not just as healthy as a fully plant-based diet. What the movie (and many authors and dieticians and doctors etc.) don’t take into account is the other main reasons people become and stay vegan, which are the ethical and environmental reasons. I’m vegan because I don’t feel good about animals dying for me to eat them when I have the privilege and choice of so many wonderful plant based foods, and at this point in the game, the environmental impacts of raising animals for food are difficult to ignore, and not only from the large industrial farms. Movies/authors/dieticians/doctors etc. often also equate a vegan diet with a plant-based one and while they can mean the same thing, you can also be vegan and eat only what society would deem to be unhealthy foods! (Ben and Jerry’s dairy-free ice cream for the win!). I appreciate having a balanced viewpoint but I would also really appreciate a discussion on the elements of a diet that aren’t purely about nutrition! This is a great way to respond to this movie with some credible sources! I’m responding next week and I’ll make sure I share your link! PS In Defense of Food is my FAVORITE! It has the best approach focusing on real food! Thank you for addressing What The Health. Im not a nutritionist but I am a scientist, and the intellectual dishonesty of cherry picking individual studies (instead of looking at things in the context of the rest of scientific literature) to further someone’s agenda really gets me riled up. When we do research and publish papers, very often we are working on very specific problems that cannot be easily generalized. I’m sure I’m preaching to the choir here, but studying cancer is my job, and people misunderstanding science gets me very cranky! Kath, it’s fine if being vegan isn’t for you. How ever the term plant based has meant that ones diet is based on plant food. A smoothie with a cup of cows milk is not plant-based. 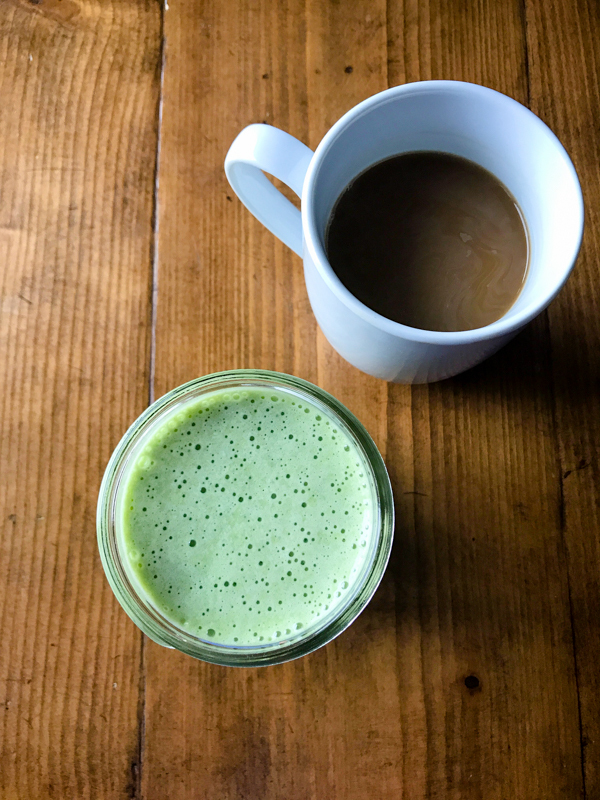 It’s easy to make a plant based smoothie with plant milk. Please don’t confuse people by implying that a diet with animal products is plant-based. It’s an omnivorous diet. Eating lots of plant foods is great, but it’s not the same as plant based. Plant based means to get nutrients solely from plant. Like protein, vitamins, etc. it’s not as strict as vegan, and it’s a more appropriate term for people who aren’t strictly vegan, but you are far from plant based from the meals you post. We differ on our definitions. Plant-based to me means the majority of foods you consume are plants. That would be in contrast to a plant-ONLY diet. Just like a “lab-based course” might emphasize labs, but that doesn’t mean you don’t also take tests, have lectures, or do homework. As an RD I second anything by Ellyn Satter as well as Intuitive Eating- great resources. Thank you for your post, there is enough confusion about nutrition! I have read parts of a book called the Plant Paradox that says most fruits and vegetables are bad due to lectins! But avoiding those would leave very little to eat. I try to follow your lead and try to buy the best I can and more vegetables and fruit and less packaged. Have you ever read Eating Animals Kath? It is meticulously researched and well-written. Foer covers the three drivers for cutting out meat and fish from your diet (health, environmental and animal-welfare). He also addresses “humane” meat. I cannot recommend it enough. The Art and Science of Low Carbohydrate Living by Phinney and Volek. I have Rheumatoid Arthritis and eating low carb has made a big difference in my inflammation levels. Such an interesting post! I will try to get a hold of some of them, especially SuperFoods HealthStyle. I can recommend “Eating Animals” by Jonathan Safran Foer. It’s the ratio of plants to all of the other stuff that is most important in my book. Kath! I’ve read you forever but not much recently. Did I miss this? Do you have a book deal? How exciting! When will it be out? Name? I love your balanced take on all things and I agree with some your other posters about loving anything written by Michael Pollan. Hi Kath. Great post. I appreciate you calling out scare tactics. They are something I would have been hurt by in my younger years. I know you have mentioned listening to podcasts in the past. Have you stumbled upon Food Psych with Christy Harrison yet? I have learned a lot about intuitive eating and health at every size listening to the conversations Christy has with interesting, thoughtful people. As a nurse practitioner, it has helped me think about how to approach patients differently. It has also had positive effects on my own life. No but thanks for the rec! Thank you for touching on mental health/Eating disorders and Orthorexia! As an RD working in the mental health field it is difficult to reteach or fight back against the demonization of food. This type of rhetoric that we see is never beneficial and often more harmful than people realize; especially to a part of the population that doesn’t have access or ability to make informed decisions about their diet.. I agree! I’ve watched “What the Health”, as well as every other food documentary that I have been able to find over the past 15 years or so, and I thought that “What the Health” was one of the poorer documentaries I’ve seen. 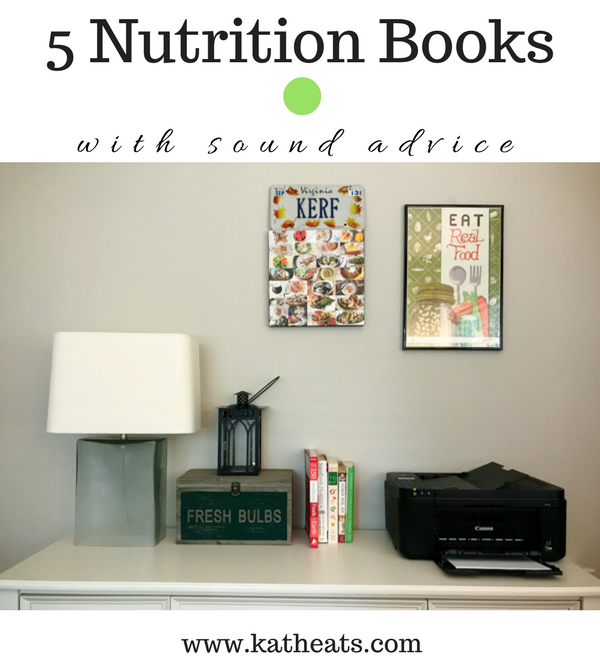 Nutrition is one of my passions, so most of the reading I do is in that area, such as the books you’ve recommended. I am not a vegan, but I have seen far better arguments for a vegan diet than “What the Health” was able to present, so I am surprised that this documentary is getting so much attention, and is leading so many people to suddenly now choose veganism. The book “The China Study” presents far better research for a vegan diet, as do numerous other books and documentaries. Anyway, I also don’t know why people feel the need to attach a label to how they eat. I once had a friend who said she was vegetarian, but one morning at brunch she realllllly, reallllly wanted a piece of bacon. I told her that she didn’t have to put her “food-self” into a little box with all these rules, and didn’t have to name her diet. She could eat vegetarian most of the time if she wanted, and still have a piece of bacon when she felt like it. She could be an “eat-whatever-the-hell-I-want-a-tarian.” She loved that idea, and dug in, and was happy. She then carried on eating mostly vegetarian, most of the time, but without the guilt or confusion if she felt like a burger one day. Anyway, armed with a lot of nutritional knowledge, I never stress about what I eat, never feel guilty about what I eat, and have never had a better relationship with food. Everything in moderation (even moderation) 😉 Also, I focus on adding things not subtracting from my diet … as soon as people tell themselves they “can’t” have something, they often crave it even more. All the books on nutrition by Dr Mark Hyman are focused on improved health and removing causes of inflammation, disease, and malfunction of the body. I think he hits true to center on all the topics, including the right balance on animals & plants. If you haven’t heard of him, you should. He is very pro-life, pro-health, and his information is based on science, not opinion. All great recommendations! The book that really sparked my “aha!” moment and started me on the path to being a dietitian is Eat, Drink, and Be Healthy by Walter C. Willett (of Harvard’s School of Public Health). I even wrote about it in my application for graduate school! Have you read How Not To Die by Dr Micheal Gregor? It’s about a whole food, plant based lifestyle, and is full of research to back it up. Research is definitely important to me. I wasn’t a huge fan of What the health, either, because a lot of the medicine in it is faulty. I appreciated what the filmmaker was trying to do, but I think it could have been done better. Thanks for the good discussion and recommendations! I read “Animal, Vegetable, Miracle” by Barbara Kingsolver (and her family!) a few years ago, and it’s stuck with me ever since. It’s not exactly a nutrition book, but it is a food related book that made me consider aspects of my diet that I hadn’t before. It’s about the Kingsolver family’s shift to a diet of locally produced food, with research and recipes thrown in too. I found it to be educational, thought-provoking, and very enjoyable. I highly recommend it! 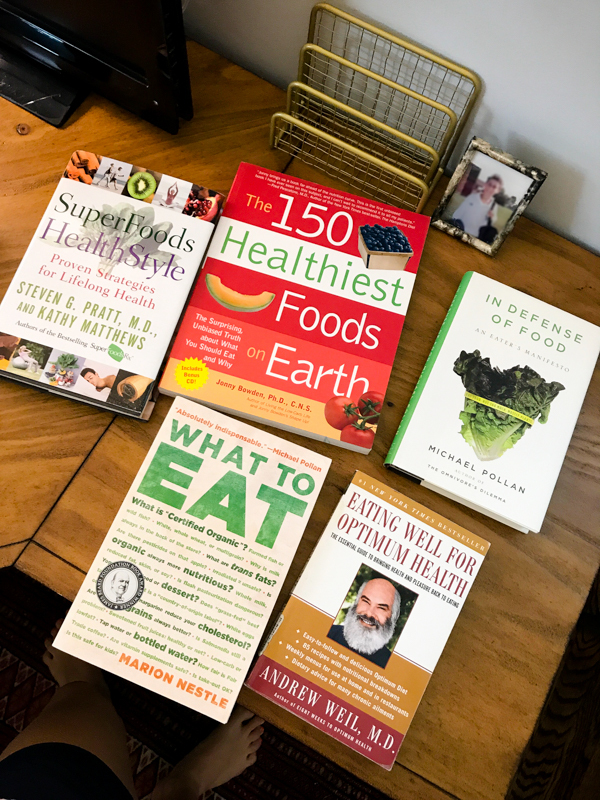 I have read most of the books you’ve mentioned, and own the Andrew Weil one. I have been reading Robb Wolf’s new book Wired to Eat. He has backed off his “Paleo is the only way to eat” stance, presenting more evidence that some people handle carbs better than others. He still recommends a 30 day paleo “reset” followed by a test of various carbs to see how they affect you. My general eating is omnivore. I think a balance diet that doesn’t blanketly exclude whole food groups. Living inAlaska it is hard to get fresh, quality fruits and veggies for 3/4 of the year. We do however have wonderful seafood! I eat a lot of fresh produce all summer, from my own garden and local farme rs’ markets. Excellent post! I am on the fence about watching the doc. I did my MS in Epidemiology with a focus on nutritional Epidemiology (though now working in infectious disease epi) so I get very frustrated at the misrepresentation of scientific studies and the scare-mongering related to diet and nutrition. I was a vegetarian for 23 years, so I am extremely keen on a plant-focused diet (only started eating limited quantities of meat in pregnancy for a variety of reasons- intend to go back to veggie when I finish breastfeeding). Nestle and Pollan are fantastic- have you read Mark Bittman’s work? I think he also has a realistic approach to eating, following his own health issues. Fab post Kath. I think you are spot on with your appriach to food. I love your squiggly line idea and that it is easier to add than subtract. Thanks for this post! I also love “Eating Animals” and “Eating Intuitively” (apparently I love books that start with the word ‘eating’ lol) and anything by Marion Nestle (like “Food Politics”). I became a food policy nerd while I was in law school and she is the goddess of food policy. I totally agree with you about What the Health. It’s not that I’m not supportive of eating mostly plants or plant-based foods, but the movie did a total cr*p job of backing up their claims with science or causation-related claims. I watched it with my husband who’s an econometrician/methodologist professor, and he was horrified at how poorly done it was, in that respect.